After Connecticut Agricultural College became Connecticut State College in 1933, sports teams were called "Statesmen" instead of Aggies. That would only last until December 1934, after the Husky was chosen as the college mascot. 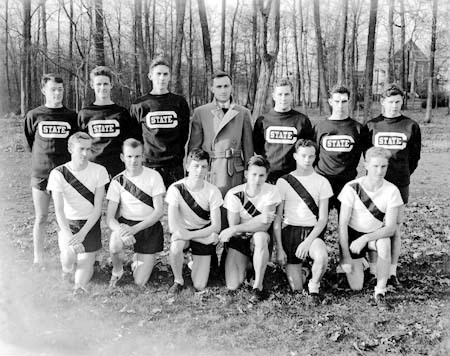 This photograph shows the CSC cross country team (they were called the "Blue and White Hill and Dalers") in their new "State" jerseys in the fall of 1933, with Coach Knute H. Andersson in the center of the back row. Behind them, through the trees to the right, is the campus Dining Hall - known as the "Beanery". Today it is the William Benton Museum of Art.